Banking jobs are an excellent fit for anybody interested in personal finance and business. 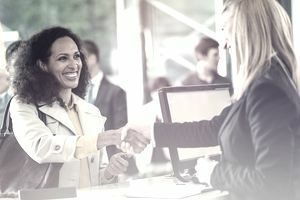 Banks typically provide good benefits, opportunities for advancement, and a variety of positions that include customer-facing roles and analytical duties. If you like the idea of working in an office environment and working with numbers, you may want to try a career in banking. Start by identifying the type of banking career that appeals to you most, and develop your skills to advance your career. Pick your path: You can work in retail banks and credit unions around the country, commercial divisions with a focus on business needs, investment banks that help firms raise capital, and other institutions. Develop your skills: Before you get a job as a banker, it’s critical to be good with numbers. Study math, statistics, or business to build a strong foundation—but don’t ignore “soft” skills. If you can score an internship with a bank or other financial-related business, you’ll gain valuable experience and meet people who can help you move forward. Customer service and sales skills are also helpful. Meet requirements: You can get a job as a teller with a high school diploma or GED, but personal bankers typically need a college degree. For investment banking, loan origination, or financial planning, you may need advanced degrees, designations, or licenses to land a job or get promoted. That said, you can often get hired in an entry-level position and meet those requirements through on-the-job training and employer-paid programs. Get hired: It’s easy to apply for open positions—and that’s especially effective for entry-level roles. But create your own opportunities by walking into banks and credit unions that you think would be a good fit and asking about available positions. Go through the interview process with several potential employers to learn more about your career path and sharpen your skills. For higher-level positions, use your network and try informational interviews to learn more about opportunities. Move up and branch out: There’s nothing wrong with becoming a banker and enjoying a long career in one place. But if you have the desire, you can move into management or director roles, regulatory compliance, or accounting. The banks you’re most familiar with are probably retail banks. Those institutions, located in almost every town, help individuals and businesses with essential financial functions. When you become a retail banker, you can find job opportunities nationwide. You’ll excel if you have customer service skills and you’re good with numbers. Tellers: Retail banks and credit unions are an excellent place to start your career. You can start as a bank teller with a high school diploma or GED and continue your studies or move on from there. But you don’t have to move on—life as a teller can be a satisfying lifelong career. Tellers work with the local community and develop relationships with customers. Personal bankers and loan officers: With some work experience and a college degree, you can help customers with more complex needs. Direct them toward bank products and services that can help them manage their finances, and assist them with the process of getting home and auto loans. You can also help local businesses with basic banking needs and financing. Sales skills: Becoming a banker is about more than just helping customers make deposits and withdrawals. You also need basic sales skills and the willingness to promote your bank’s services. You don’t need to be misleading or take advantage of anybody—learn to arrive at mutually beneficial solutions that truly help customers while bringing in profitable business. Commercial banks focus on the unique needs of businesses. For example, you can help businesses accept credit card and other types of payments. They also need guidance on managing their assets while limiting risk. You might even help companies do business overseas or borrow money to expand operations. Useful skills: To become a commercial banker, it’s essential to understand how businesses work. A business degree is helpful, and an MBA is even better. You need the ability to evaluate a business’ finances and determine what products and services might be a good fit. Sales skills are important for business bankers—banks and credit unions need revenue from active businesses, and it may be your job to grow and retain business clients. Investment banks help businesses raise money in financial markets, and they are often involved in mergers and acquisitions. Becoming an investment banker is a competitive endeavor that requires serious commitment. Banks typically hire high-achievers who thrive in high-pressure environments. Life of an investment banker: Investment banks are most common in major metropolitan areas (New York City, for example) where potential clients are nearby. To work for the largest investment banks, plan to devote much of your waking life to your career. Analytical skills: You need to have strong spreadsheet and analytical skills, and to advance at most firms, you may need graduate degrees and designations. For example, a master’s degree in finance or a Chartered Financial Analyst (CFA) designation is common with investment bankers. The career of an investment banker is extremely demanding, but successful bankers have the potential to earn high salaries and bonuses. Before you pursue a career as an investment banker, evaluate what’s most important to you in life—you may need to remind yourself of those goals during late-night work sessions.